Handicap accessibility is an issue that impacts everyone, whether you're a homeowner looking to future-proof your house, a business owner who needs to comply with the Americans With Disabilities Act (ADA) guidelines, or a property manager who wants to make their church, school, or multi-tenant site safer for all users. Here at The Vinyl Outlet, our team of professional vinyl railing installers have the skills and experience needed to provide you with a custom-designed, ADA-compliant railing system that will instantly make your property safer for users of all ages and abilities. In the past, handicap accessibility used to mean adding industrial-style ramps, cold steel-tube railings, and unsightly additions to your home or business. Fortunately, designers have recognized the ever-growing demand for durable, attractive materials for wheelchair ramps and railings that match existing building colors and styles. Our team of vinyl railing specialists here at The Vinyl Outlet can help you choose the perfect products for your specific application. We sell only premium-grade railings fabricated right here in Western New York, and we back all of our vinyl products with our industry-leading lifetime warranty. 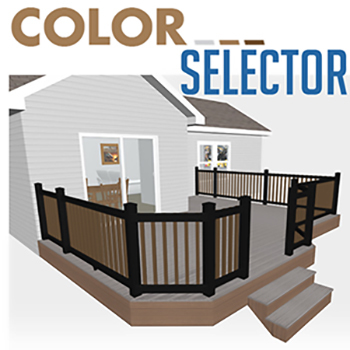 We can custom-design vinyl railing in a wide variety of colors and styles, giving you an ADA-compliant product that blends seamlessly with your existing structure. Better yet, because we live and work right here in Buffalo, we make sure that all the vinyl products we sell can stand up to our long, snowy winters and hot humid summers to deliver years of worry-free service. While features to improve handicap accessibility are essential for anyone who lives with a mobility impairment, the fact is that building features like rails and ramps make life easier for all users. Something as simple as a vinyl railing can make the difference between slipping and falling on an icy surface, or making it inside safely on a cold winter day! To learn more about how we can help you improve handicap accessibility at your Western NY home or business with durable, long-lasting vinyl railing products, contact us today to speak with one of our product specialists.